buttonbox designs: End of November Already? E-book review of "Truth in the Tinsel"
End of November Already? E-book review of "Truth in the Tinsel"
It was my birthday on Wednesday, and one of the things I love about having a birthday at the end of November is that as soon as its done, I feel as though I have permission to start celebrating the Christmas season! Now, I'm not a fake tree person, so I always wait a bit before I set up the tree and decorate it (otherwise it would be drier than the Okanagan in August by the time Christmas day actually comes around), but I do like to bust out the Christmas music, the Christmas baking and the Christmas boxes full of Christmas decor. This year I'm most excited about celebrating the advent season with my family. I have very vivid and fond memories of exploring the season of advent with my family. My mom, especially, always tried to help us stay focused on the birth of Jesus, Emmanuel, God with us, rather than on the presents and festivities and programs. One of the best resources my mom used to guide our times in exploring the true story of Christmas was a book from Focus on the Family (I'll include the title of this later, if I can figure it out!). 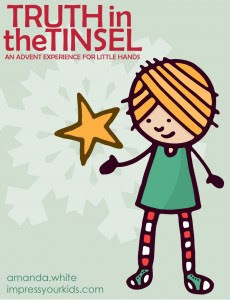 Buy Truth in the Tinsel here! This year I'm really excited to use a resource that's brand new, an e-book by a bloggy friend from Atlanta, Amanda White called "Truth in the Tinsel". First of all, can I say how much I love the title and design of the book?!! I've never, ever read an e-book before, let alone reviewed one on my blog, and I can't be more thrilled than to share this book with you! In Amanda's own words, "This is an adventure for families to learn the story together. It’s an experience with the greatest story every written and the greatest gift ever given—God’s own Son, Jesus the Christ!" This e-book guides families with preschool through early elementary aged children through the use of a "traditional" advent calendar. In the e-book Amanda lays everything out in a simple and accessible way from supply lists (based on supplies that most families already have laying around their homes), to abbreviated plans for busy families, to templates, discussion guides, extra activities and step by step instructions on how to create each ornament. And I have to say, in looking through each day and what ornaments Amanda has suggested doing, I am super excited about some of them, as they are projects that were on my to-craft list for my kids and I! Best of all, "Truth in the Tinsel" is only $4.99! Less than you'd spend on a grande white peppermint mocha, or a box of Christmas oranges! Plus, if you purchase it on November 25, its only $2.99. This post has an affiliate link. Thanks for supporting my blog!